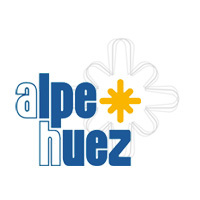 To make your life easier for staying in Alpe d'Huez, The city hall arranged shuttle bus services corporated by The Resalp company. 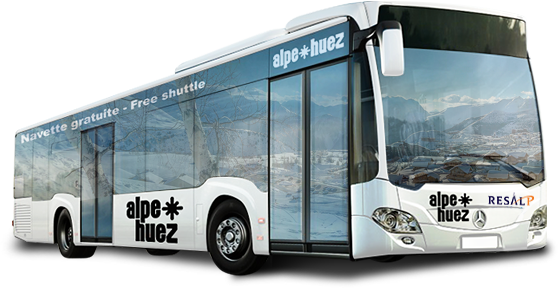 During winter season, we have 4 lines of shuttle bus (A, B, C and night line) allowing you to reach the ski slopes, the main accommodations, the Altiport and bus stops in the resort. 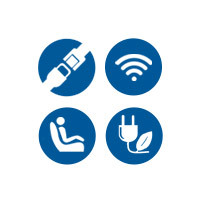 Save time with Resalp ecological shuttle bus ! 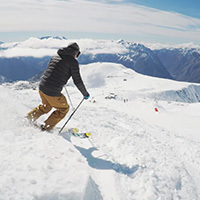 So that your trip takes place in the best conditions, we suggest you to follow in real time the route of the shuttles by geolocalization, as well as its times of passage to the various stops. And because the air is pure in the mountains, and we want it to remain, the shuttles on which you will take place respect the environment. Indeed, we are proud to welcome travelers on board of the first Scania hybrid bus traveling in the Alps! This hybrid bus completes a fleet of 3 Mercedes Citaro buses compliant with the ecological standards of Euro6, the most demanding in terms of environmental friendliness. 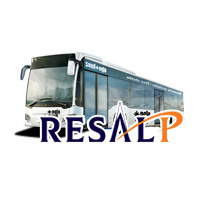 If every year, about 2 million travelers trust Resalp, it is also because drivers who drive coaches are trained to drive on snowy roads, the fruit of know-how recognized in other ski resorts in the Alps. At night, the shuttle service is also available, on a single circuit with many stops, allowing holidaymakers to reach their residence safely. Is the shuttle service available during summer ? Resalp shuttles also operate during the summer and off-peak periods, on the same circuit as the winter night shuttle.